Of all the social skills critical to living in Milan, the mother ship of them all is a concept known as bella figura. More or less translatable as cutting a fine figure, it embraces not just how one dresses, but also manners and comportment. Wearing track pants downtown would, for example, be the polar opposite of bella figura. Not even when popping out to the corner store for milk, please. Ditto using the familiar tu form prematurely. Or offering to help clear the table when you’re at someone’s house for dinner, even with a good friend. Quick as a wink I said no, of course not, and rushed upstairs to put on a dress. And I have to say, the performance totally warranted the extra measure of respect that dressing for the occasion implies. Rather than the amateurish local production I was expecting, it was one of the best operas I’ve ever attended, with stunning voice quality. The opera was The Barber of Seville; for the first time ever, I actually understood what Figaro was going on about in his famous ‘factotum’ aria. It was as easily entertaining as watching a modern musical. 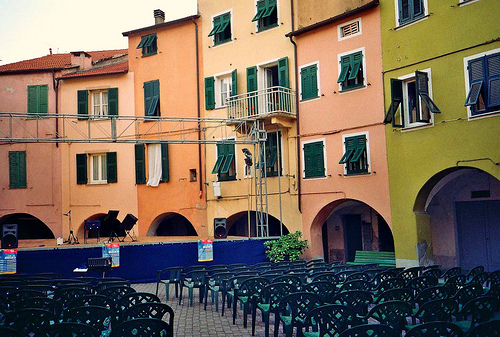 If you’d like more information on the Varese summer opera, here’s the link: http://www.liricavareseligure.org/galleria_3.html It’s an exceptional night out. But wear something nice! Just had to echo Debra’s words as it was exactly what I had in mind to say before I even got to read the comments….. I love Italy not least of all for the way people like to take care and dress appropriately. Not designer labels and heels everywhere – just dressing to suit the context. Something Australians could learn so much from…One of my rant topics I’m afraid. Lovely post Shelagh! Really enjoying the blog too! I have to admit I was a bit of a slob, living in the country in Canada, before moving to Milan. The Milanese dress sense gave the whole family a much improved style! Even our kids, now in their late teens, have a clothing flair I doubt they would have developed without having lived there. I agree Debra, but now that we live here in the Appennines it is basically trousers, boots and heavy jackets and summer is shorts and blouses. I sometimes wish for a chance to wear a dress or skirt, but that is now our simple life. How nice not to think each day of what to wear to the office and I am an Australian who always insisted on dressing appropriately, although living in Canberra unfortunately many didn’t have a clue, but I don’t miss it. Happy Australia Day to you all the way from Polinago! I wish people here in Australia would take a bit more care when dressing to go out. It seems anything goes. Same thing in Toronto; the opera and ballet audiences here are now a mixed bag of dressed up and jeans. Perhaps this is old-fashioned but I feel that putting on something nicer is a gesture of respect for the performers, even if they can’t see you. Besides, it’s fun to dress up!